Apple's most powerful portable machines, refreshed on July 12, 2018. Up to 4 TB SSD on 15", up to 2 TB on 13"
8th-Gen "Coffee Lake" chips: Up to 6-core on 15", up to 4-core on 13"
Subscribe for regular MacRumors news and future MacBook Pro info. Few details are available beyond the size, but it will be larger than current MacBook Pro models and the largest MacBook Pro Apple has introduced since the 2017 MacBook Pro. Apple could potentially implement a larger screen size through slimmer bezels, as demonstrated in a simple mockup below. If released in 2019, the 16-inch MacBook Pro will also mark the shortest time between major design refreshes, as Apple last overhauled the MacBook Pro lineup in the summer of 2016. 13-inch MacBook Pro models in 2019 could see an update that would increase the maximum amount of RAM from 16GB to 32GB. It's not clear exactly when in 2019 we'll get new MacBook Pro models, but "Sunny Cove" Intel chips appropriate for an update were announced by Intel in December 2018. Intel plans to make its 10-nanometer Sunny Cove chips available later in 2019, so that could be the chip Apple plans to use in a 2019 MacBook Pro update coming sometime this year. Kuo has also said that Apple is working on a new 15 to 17-inch MacBook with a Mini-LED display, which, given the size, could be in the MacBook Pro family. These machines with Mini-LED displays are said to be planned for the first half of 2021, but Apple likely has refreshes coming in the meantime, including the previously-rumored 16 to 16.5-inch machine. 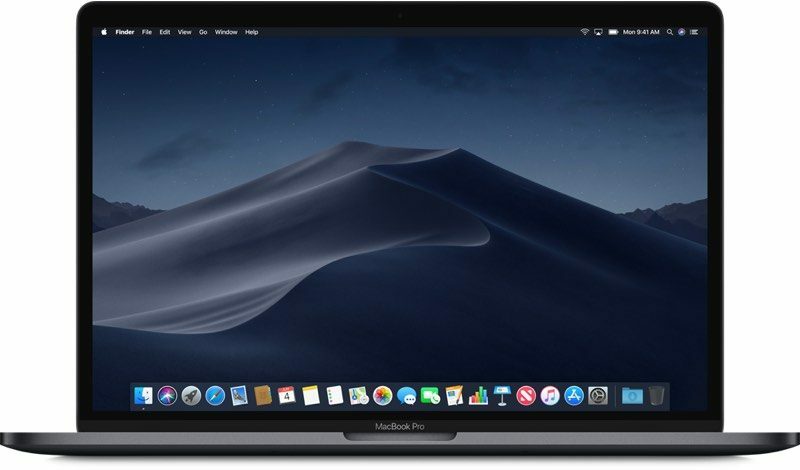 On July 12, 2018, Apple introduced refreshed MacBook Pro models aimed at professional users, with super fast processors, more maximum RAM, better GPUs, and a slew of other improvements that make this most powerful and capable MacBook Pro Apple has ever launched. Available in the standard 13 and 15-inch size configurations, the 2018 MacBook Pro doesn't feature external changes, continuing to use the same design that was first introduced in 2016, but the machines include multiple under-the-hood improvements. The revamped MacBook Pro models are equipped with Intel's 14-nanometer 8th-generation Coffee Lake chips, with quad-core processors in the 13-inch models for the first time and 6-core processors in the 15-inch models. The 15-inch MacBook Pro offers 70 percent faster improvement compared to last year's model, while the 13-inch MacBook Pro offers two times faster performance. 13-inch models use Intel Iris Plus Graphics 655, while 15-inch models are equipped with built-in graphics and either a Radeon Pro 555X or a Radeon Pro 560X, each with 4GB GDDR5 memory. 4TB of SSD storage is available in the 15-inch machine, while the 13-inch machine can support a 2TB SSD. As of November 14, Apple also offer higher-end AMD Radeon Pro Vega graphics cards as an upgrade option in the MacBook Pro. The new graphics cards offer 60 percent faster graphics performance for tasks like video editing, 3D design, and gaming. Apple in March also adjusted the pricing of MacBook Pro SSD upgrade options. Up to 32GB RAM is available in the 15-inch MacBook Pro for the first time, while the 13-inch model maxes out at 16GB. An OLED Touch Bar with Touch ID continues to be included along with a larger Force Touch Trackpad, and all new machines offer four Thunderbolt 3/USB-C ports. 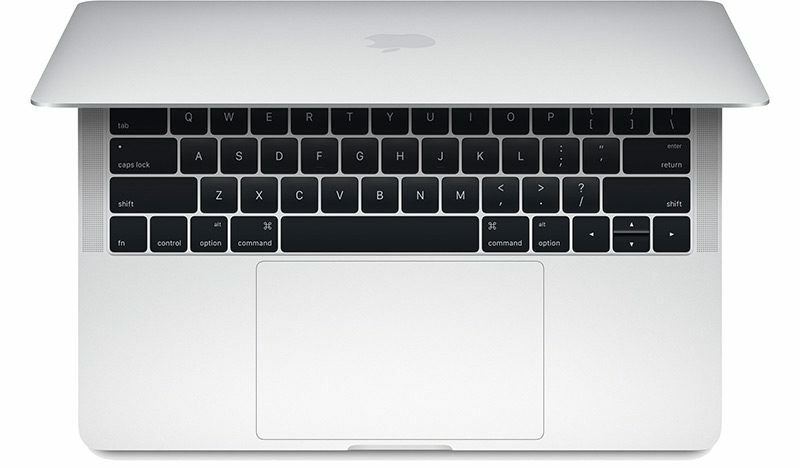 The Touch Bar and the Retina display of the MacBook Pro have been improved with support for True Tone functionality that adjusts white balance to match ambient lighting, and Apple has included a new third-generation butterfly keyboard for quieter typing, though it is unclear if this keyboard addresses failure issues present in previous MacBook Pro models. A new T2 chip offers enhanced security with secure boot and on-the-fly encrypted storage along with support for hands-free Hey Siri commands. All day 10 hour battery life is still supported, and 2017 improvements like a brighter 500 nit display and faster solid state drives are included. You can purchase the new MacBook Pro models in Silver or Space Gray. Bluetooth 5.0, 802.11ac WiFi, stereo speakers with two microphones, and a 720p FaceTime HD Camera are other included features. Pricing on the 13-inch MacBook Pro starts at $1,799 for a 2.3GHz Core i5 processor, 8GB RAM, and a 256GB SSD, while pricing on the 15-inch MacBook Pro starts at $2,399 for a 2.2GHz Core i7 processor, Radeon Pro 555X, 16GB RAM, and a 256GB SSD. Custom configuration options are available for an additional price. The new MacBook Pro models are available for purchase from Apple's online store and Apple retail stores. Apple is continuing to sell older 2017 13-inch MacBook Pro models with no Touch Bar at more affordable prices that start at $1,299. Some 2018 MacBook Pro owners have reported hearing intermittent crackling noises from the built-in speakers during audio playback. It is not clear what's causing the issue, with multiple apps including iTunes, GarageBand, and Safari affected, but it seems to be related to the T2 in the MacBook Pro. Apple appears to have addressed this problem, and a similar problem with kernel panics, in a supplemental update that was released in late August. Some 2016 and newer MacBook Pro models are experiencing backlight issues, a problem that more heavily affects Touch Bar-enabled machines. The result is a sort of "stage light effect" at the bottom of the display, which is distracting and renders it nearly unusable. According to repair site iFixit, the issue is caused by thin, fragile flex cables that connect the display with the display controller board on 2016 and newer MacBook Pro models. Repeatedly opening and closing the display lid can wear down the cables, which are not as durable as cables used in past machines. Because this is an issue that appears over time, many of those affected are outside of the one-year warranty period. A repair requires replacing the entire display assembly, which can cost upwards of $600. Some MacBook Pro owners have reported damage to their speakers from using recent versions of Adobe Premiere Pro. The software appears to occasionally cause loud, distorted audio to play through the speakers, which can cause permanent damage. 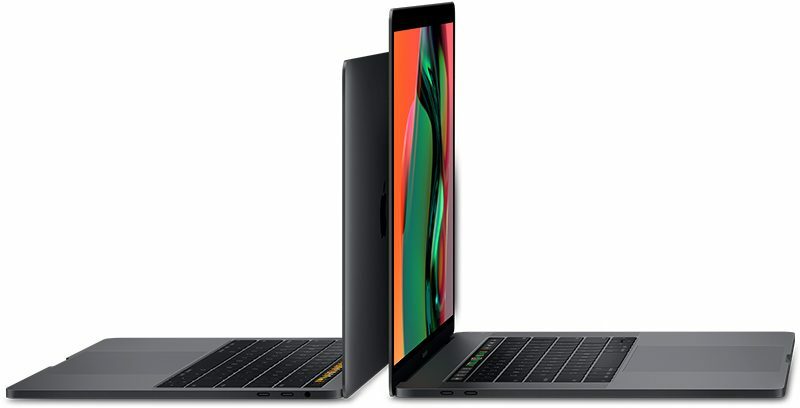 Apple in October 2018 announced an SSD service program for 13-inch non-Touch Bar MacBook Pro models sold between June 2017 and June 2018. According to Apple, a "limited number" of these machines with 128 and 256GB SSDs can experience an issue that can lead to data loss and the failure of the drive. Apple is providing service to these drives free of charge. The new 2018 13 and 15-inch MacBook Pro models continue to use the same design as the 2016 and 2017 MacBook Pros, with the smaller, thinner, and lighter design that Apple first introduced two years ago. Constructed entirely from aluminum, the MacBook Pro is available in either Silver or Space Gray, with a thin hinge design, a wide Force Touch Trackpad, a third-generation butterfly keyboard, a Touch Bar, and no light-up rear Apple logo. The 15-inch MacBook Pro measures in at 13.75 inches long, 9.48 inches wide, and 15.5mm thick. It weighs four pounds. The 13-inch MacBook Pro measures in at 11.97 inches long, 8.36 inches wide, and 14.9mm thick. It weighs three pounds. The 2018 MacBook Pro models continue to use the same display with 500 nits of brightness and P3 Wide Color support that was introduced in earlier MacBook Pro machines, but with one notable addition -- True Tone support. True Tone works through a multi-channel ambient light sensor that's included in the new MacBook Pro models, which is able to determine both the brightness of the room and the color temperature. After determining the white balance, the MacBook Pro is able to adjust both the color and intensity of the display to match the room's lighting for a more natural, paper-like viewing experience that also cuts down on eyestrain. True Tone has been previously available in the iPad Pro and the iPhone X, but this is the first time it's been brought to a Mac. It does require the display of the MacBook Pro for the feature to work. When using certain external monitors with the new 2018 MacBook Pro models, including the Apple Thunderbolt Display using an Apple Thunderbolt 3 to Thunderbolt 2 adapter, the LG UltraFine 5K Display, and the LG UltraFine 4K Display, the built-in True Tone feature also extends to the connected display. The display of the 15-inch MacBook Pro features a 2880 by 1800 native resolution at 220 pixels per inch, while the display of the 13-inch MacBook Pro features a 2560 by 1600 resolution at 227 pixels per inch. Both displays support millions of color and include P3 Wide Color as mentioned above for more vivid, true to life colors especially in the green and red spectrums. The 2018 13 and 15-inch MacBook Pro models include a third-generation butterfly keyboard that Apple says offers a quieter typing experience. The keyboard uses butterfly-style keys with dome switches beneath each key that have been optimized for a more responsive feel, delivering a greater sense of keyboard travel for a more satisfying press under the fingers. 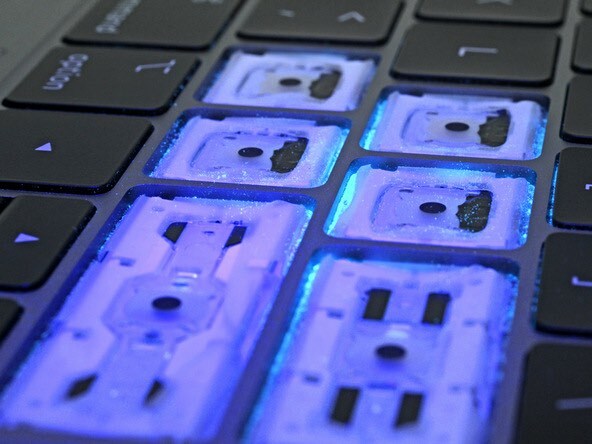 Prior butterfly keyboards in 2016 and 2017 MacBook Pro models have been criticized for occasional failures when exposed to crumbs, dust, and other small particulates. Apple has said that the focus of the keyboard redesign was making it quieter, but while the company has not publicly admitted it, it also improves reliability and better prevents dust from getting into the keys. An iFixit teardown of the 2018 MacBook Pro found a thin, silicone barrier that's been added to the keyboard, providing protection for each key. iFixit speculated that the membrane was an ingress-proofing measure put in place to prevent dust from getting in the keys, which Apple quietly confirmed in documents sent to Apple Authorized Service Providers. iFixit exposed the new 2018 MacBook Pro keyboard to dust and sand to test its durability, and found that the dust it settled along the edges of the membrane, leaving the butterfly mechanism of the keys protected. The silicone barrier did prevent most dust from getting into the butterfly keys, but when exposed to sand, the membrane wasn't able to fully prevent keys from seizing up. This suggests that the membrane is not impenetrable, but it's more protection than offered in earlier versions of the butterfly keyboard. For earlier MacBook Pro models, Apple launched a keyboard repair program that has seen the company offering free repairs for faulty keyboards. In a statement to The Wall Street Journal, Apple recently said that it's aware of a "small number of users" who are having issues with the third-generation butterfly keyboards in the latest MacBook Pro models and apologized for the problem. 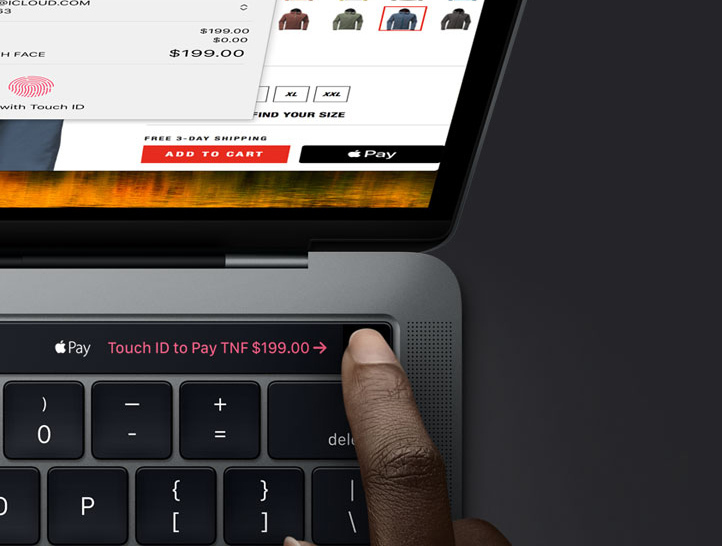 As with previous MacBook Pro models, much of the bottom of the 2018 MacBook Pro machines is taken up by the Force Touch trackpad, which doubled in size starting in 2016. Apple introduced the larger trackpad to give users more room for gestures. The Force Touch trackpad has no traditional buttons and is instead powered by a set of Force Sensors, allowing users to press anywhere on the trackpad to get the same response. A Taptic Engine powered by magnets provides users with tactile feedback when using the trackpad, replacing the feel of a physical button press. The Force Touch trackpad supports a light press, which is used as a regular click, along with a deeper press or "force click" as a separate gesture that does things like offer up definitions for a highlighted word. The 2018 MacBook Pro models continue to feature a Touch Bar, which is a small OLED Retina multi-touch display built into the keyboard where the function keys traditionally go. 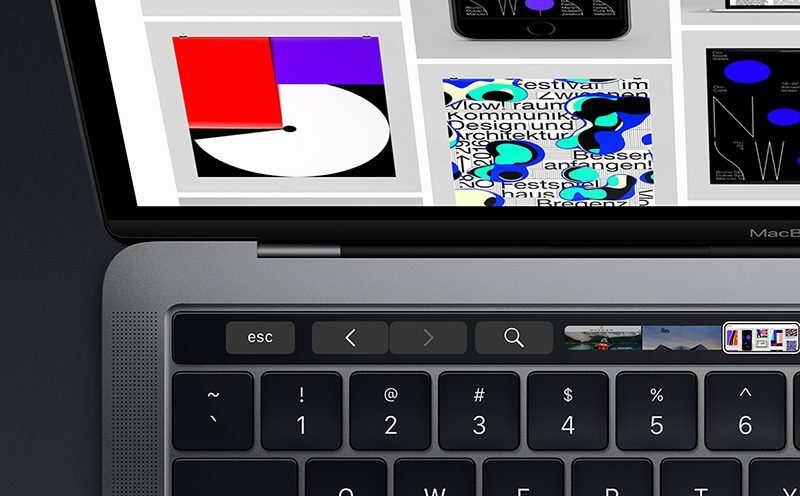 The Touch Bar is contextual and can perform a huge range of functions on the Mac depending on which app is in use. The Touch Bar is a matte-style display that blends right in with the rest of the keys on the keyboard, and in 2018 MacBook Pro machines, it supports True Tone, allowing the white balance to be adjusted to match the ambient lighting conditions. 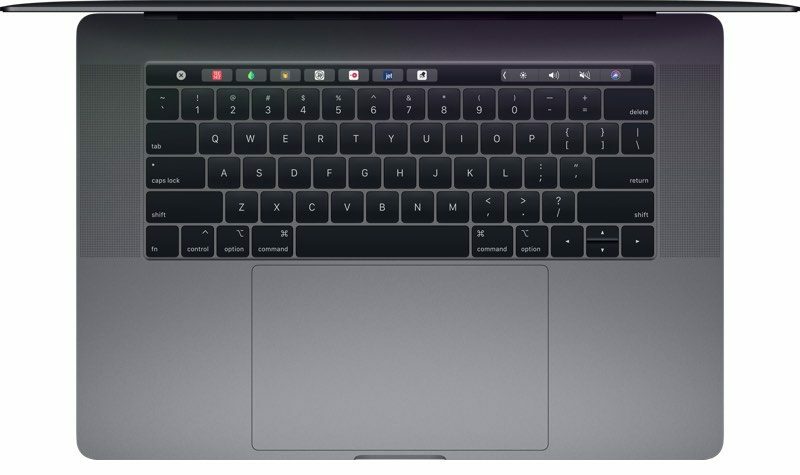 Interacting with the Touch Bar is done through taps, swipes, and other multi-touch gestures, with support for up to 10 fingers at a time available. 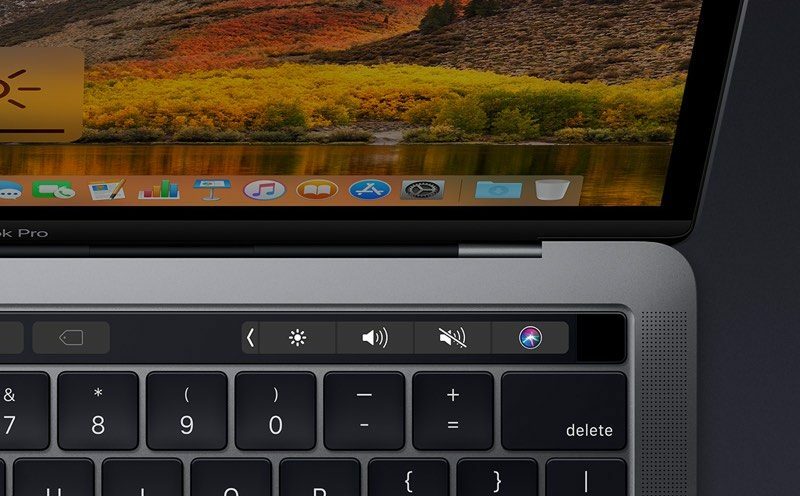 The Touch Bar consists of a static (but customizable) Control Strip on the right housing the typical system functions you need to access quickly, like volume, audio playback, brightness, and Siri, with an ESC key on the left. In the middle, there's an open spot that dynamically displays the most useful controls for the app you're using, and most third and first-party apps offer Touch Bar support. Next to the Touch Bar, there's a Touch ID fingerprint sensor with second-generation Touch ID functionality that's covered in sapphire crystal much like the Touch ID Home button on some iPhone models. Touch ID on the MacBook Pro can be used in lieu of a password, unlocking the Mac when a finger is placed on the sensor. It also replaces a password for password protected apps, and it can be used to make Apple Pay purchases in Safari. Touch ID is powered by a separate Apple-designed T2 chip with a Secure Enclave that keeps your fingerprint data and personal information safe. All 2018 13 and 15-inch MacBook Pro models are equipped with four USB-C supports with support for USB 3.1 Gen 2 and Thunderbolt 3, for Thunderbolt transfer speeds of up to 40Gb/s and USB transfer speeds of up to 10Gb/s. Each port on the MacBook Pro models is identical and can be used for the same functions, so every one can be used to power the machine. All ports support the following connections: power, Thunderbolt, USB, DisplayPort, HDMI, and VGA. Over Thunderbolt 3, the 15-inch MacBook Pro can power two 5K displays at one time or four 4K displays. 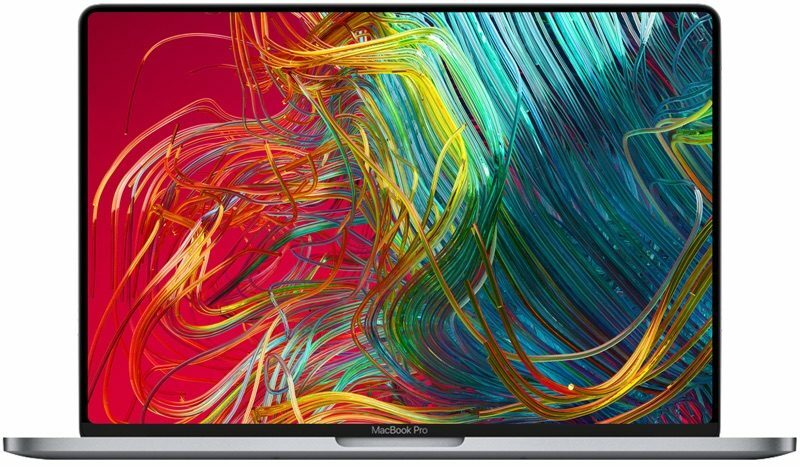 The 13-inch MacBook Pro can power one 5K display or two 4K displays. All external displays are able to run at 60Hz. 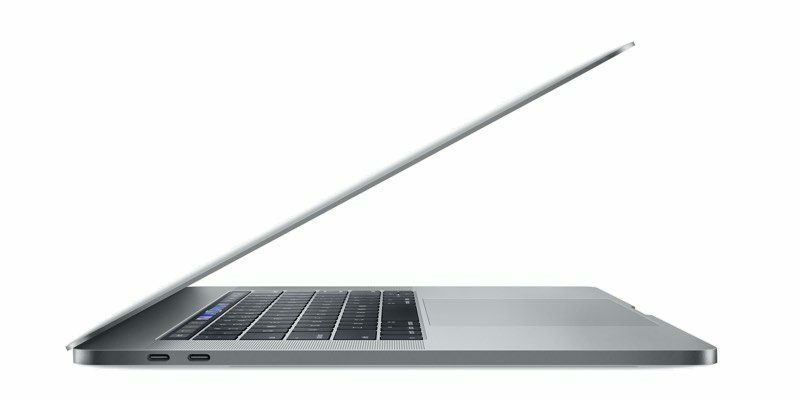 In 2016 and 2017 13-inch MacBook Pro models, the left side Thunderbolt 3 ports had reduced bandwidth due to the fact that the chips used in the machines only supported up to 12 PCI Express lanes. The processors in the 13-inch 2018 MacBook Pro support up to 16 PCI Express lanes, so all four Thunderbolt 3 ports support maximum data transfer speeds of 40Gb/s. 2018 15-inch MacBook Pro models support DisplayPort at High-Bit Rate 3, a signal standard of both DisplayPort 1.3 and DisplayPort 1.4. 13-inch MacBook Pro models support DisplayPort at High-Bit Rate 2, a signal standard of DisplayPort 1.2. 13 and 15-inch Models both have the same compatibility with external displays as previous-generation models. The 15-inch MacBook Pro supports up to two 5K displays or four 4K displays, while the 13-inch MacBook Pro supports one 5K display and up to two 4K displays. Apple's custom-made T2 chip, first introduced in the iMac Pro, is included in the 2018 MacBook Pro models to make them even more secure and to add additional functionality. The T2 chip houses the Secure Enclave processor that protects Touch ID fingerprint data and allows for secure boot and encrypted storage capabilities. It also consolidates multiple controllers, including the system management controller, image signal processor, audio controller, and SSD controller. It supports enhanced tone mapping, improved exposure control, and face detection-based auto exposure to the FaceTime HD camera, and it encrypts the SSD on the fly using dedicated AES hardware. Unique to the MacBook Pro is "Hey Siri" functionality powered by the T2. With Hey Siri capabilities, you can say "Hey Siri" to activate the personal assistant on the MacBook Pro without the need to press the physical Siri button. 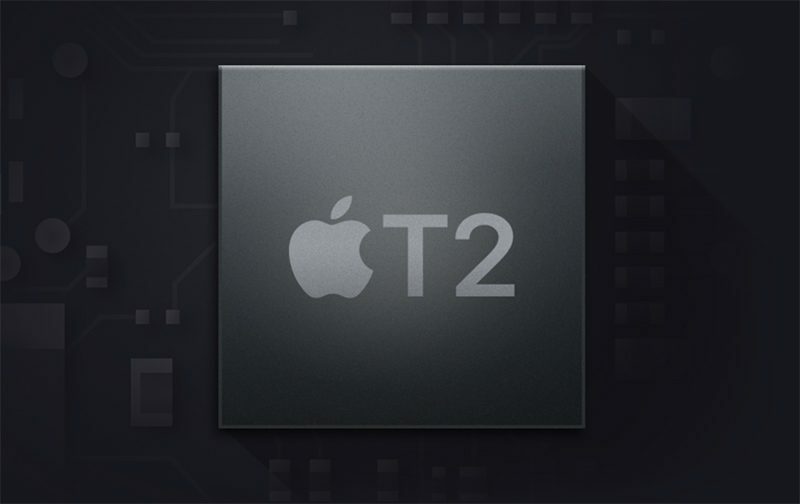 The T2 chip is a variant of the A10 in Apple's iOS devices and it runs a modified version of iOS. Apple's 15-inch MacBook Pro is the most powerful notebook computer the company sells, with a 6-core processor, discrete AMD Radeon Pro graphics, up to 32GB RAM, up to 4TB of SSD storage, and a larger size setting it apart from the 13-inch MacBook Pro. The 15-inch MacBook Pro is equipped with Intel's 8th-generation 14-nanometer Coffee Lake chips. The entry-level 15-inch MacBook Pro uses Intel's 6-core 2.2GHz Core i7 8750H processor with 9MB cache and Turbo Boost up to 4.1GHz, while the higher-end stock configuration includes the 6-core 2.6GHz Core i7 8850H processor with 9MB cache Turbo Boost up to 4.3GHz. As a build to order option, the 6-core 2.9GHz Core i9 8950HK processor with 12MB cache and Turbo Boost up to 4.8GHz. The 6-core Intel Core i9 processor is up to 70 percent faster than the equivalent processor in the 2017 MacBook Pro, according to Apple. 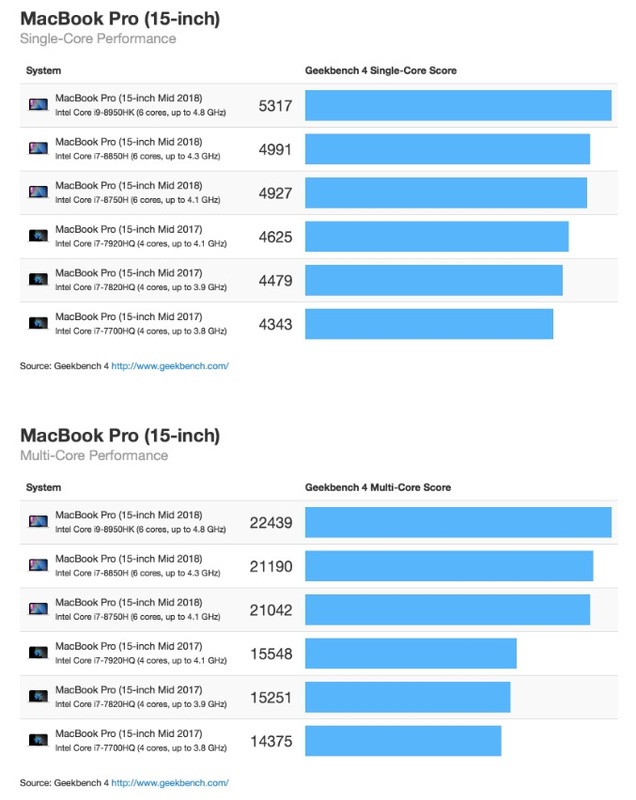 Apple's website lists several performance comparisons between 2017 and 2018 machines to show improvements, with examples below. Geekbench 4 benchmarks suggest the 15-inch MacBook Pro models offer a 12 to 15 percent increase in single-core performance and a multi-core performance boost from 39 to 46 percent compared to equivalent 2017 models. Benchmarks for the 15-inch MacBook Pro with Radeon Pro Vega 20 graphics (released in late 2018) suggest much improved performance with OpenCL scores of 72799 and Metal scores of 73953. Comparatively, machines with the Radeon Pro 560X graphics card earned maximum OpenCL scores of right around 65000 and Metal scores of approximately 57000. 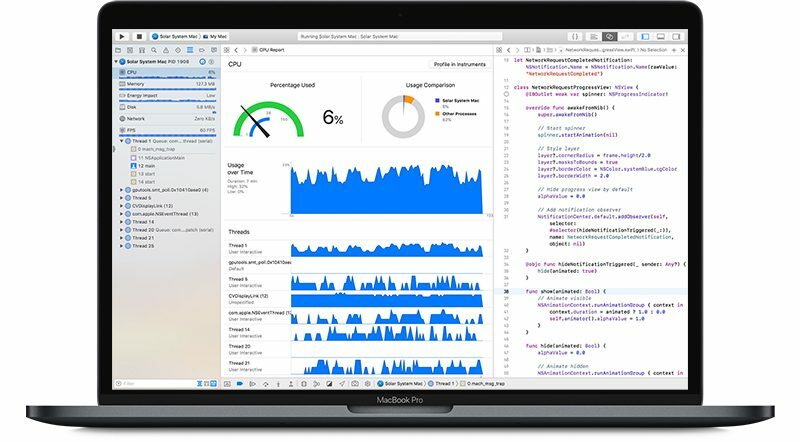 At launch, 2018 13 and 15-inch MacBook Pros were affected by a throttling issue that caused downgraded performance during CPU-intensive tasks. The issue was discovered after a YouTuber noticed excessive throttling on the top-of-the-line 15-inch MacBook Pro with i9 chip. Apple was silent on the issue for a few days before issuing a supplemental update to macOS High Sierra 10.13.6. As it turns out, the inappropriate throttling was caused by a bug and was unintentional. According to Apple, there was a missing digital key in the firmware that impacted the thermal management system, driving down clock speeds under heavy thermal loads. The supplemental update fixed the issue and should be installed on all new 2018 MacBook Pro models. Shortly after the release of the patch, multiple tests of various 2018 MacBook Pro models, including a test from Dave Lee, who originally found the problem, concluded that 2018 MacBook Pro performance was much improved. Both stock 15-inch MacBook Pro models include Intel's built-in UHD Graphics 630, along with discrete graphics cards from AMD. The entry-level machine includes a Radeon 555X with 4GB GDDR5 memory, while the higher-end machine includes a Radeon Pro 560X with 4GB GDDR5 memory. 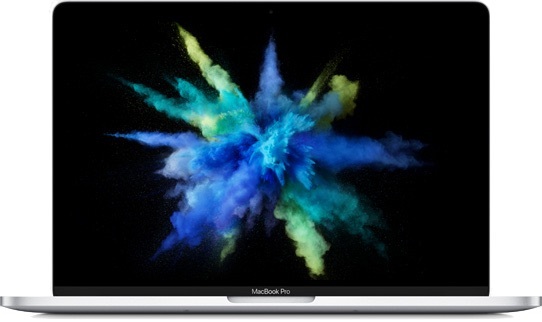 As of November 2018, Apple offers higher-end AMD Radeon Pro Vega graphics cards as an upgrade option in the MacBook Pro, with 60 percent faster graphics performance for tasks like video editing, 3D design, and gaming. 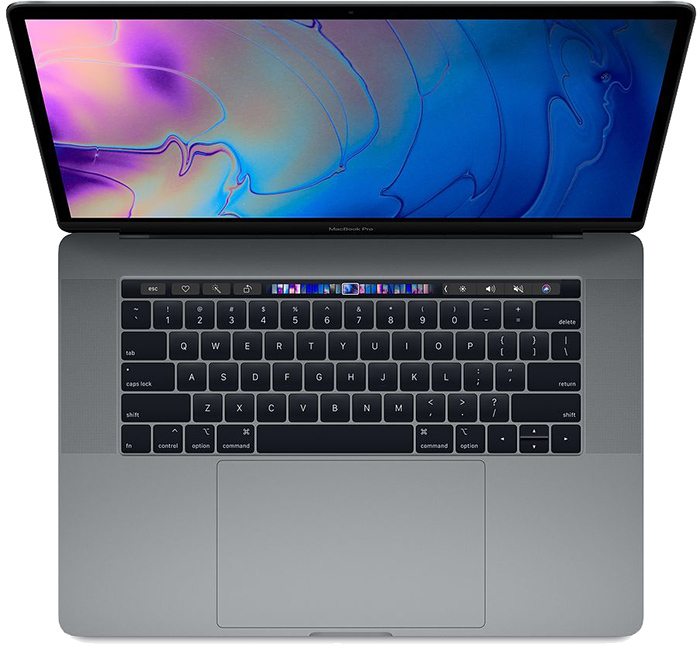 The MacBook Pro is able to switch between the two video card options based on task, using the built-in graphics for non-intensive work to preserve battery life and then switching to the Radeon Pro for GPU-heavy tasks like gaming or video editing. Apple in 2016 introduced super fast SSDs with sequential read speeds of up to 3.2GB/s and sequential write speeds up to 2.2GB/s, and that same technology is used in the SSDs of the 2018 MacBook Pro models. Storage space starts at 256GB for the entry-level 15-inch MacBook Pro, but it can be upgraded to a maximum of 4TB, up from 2TB in previous machines. The camera in the MacBook Pro has not been upgraded compared to the previous-generation machine. It continues to use a 720p FaceTime HD camera. Apple's 15-inch MacBook Pro offers "all-day" battery life with up to 10 hours of wireless web usage, up to 10 hours of iTunes movie playback, and up to 30 days of standby time. The machine is equipped with an 83.6 watt-hour lithium-polymer battery that's higher capacity than the battery in previous-generation models. Battery life is the same, however, due to the use of DDR4 RAM, higher end GPUs, and other improvements. Bluetooth 5.0 is included in the 2018 MacBook, compared to Bluetooth 4.2 in earlier models. It also supports 802.11ac Wi-Fi. $2,399 - 2.2GHz 6-core Intel Core i7 processor, Radeon Pro 555X, 16GB RAM, 256GB SSD. $2,799 - 2.6GHz 6-core Intel Core i7 processor, Radeon Pro 560X, 16GB RAM, 512GB SSD. The processor, RAM, SSD capacity, and graphics card can be upgraded in the 2018 15-inch MacBook Pro. Apple's 13-inch MacBook Pro is smaller than the 15-inch model, and that size reduction means its internal components are not quite as powerful. Rather than a 6-core processor and discrete graphics, the 13-inch MacBook Pro includes a quad-core processor and integrated graphics. The 13-inch MacBook Pro is also equipped with Intel's 8th-generation 14-nanometer Coffee Lake chips, but it uses quad-core chips rather than 6-core like the 15-inch MacBook Pro. This is the first time a 13-inch MacBook Pro has included a quad-core processor, with all previous 13-inch models limited to dual-core processors. Both of the stock 13-inch MacBook Pro models use Intel's quad-core 2.3GHz Core i5 8259U processor with 6MB cache and Turbo Boost up to 3.8GHz, while the quad-core 2.7GHz Core i7 8559U chip with 8MB cache and Turbo Boost up to 4.5GHz is available as a build-to-order upgrade option. The quad-core Intel Core i7 processor in the 2018 13-inch MacBook Pro is up to twice as fast as the equivalent processor in the 2017 13-inch MacBook Pro. 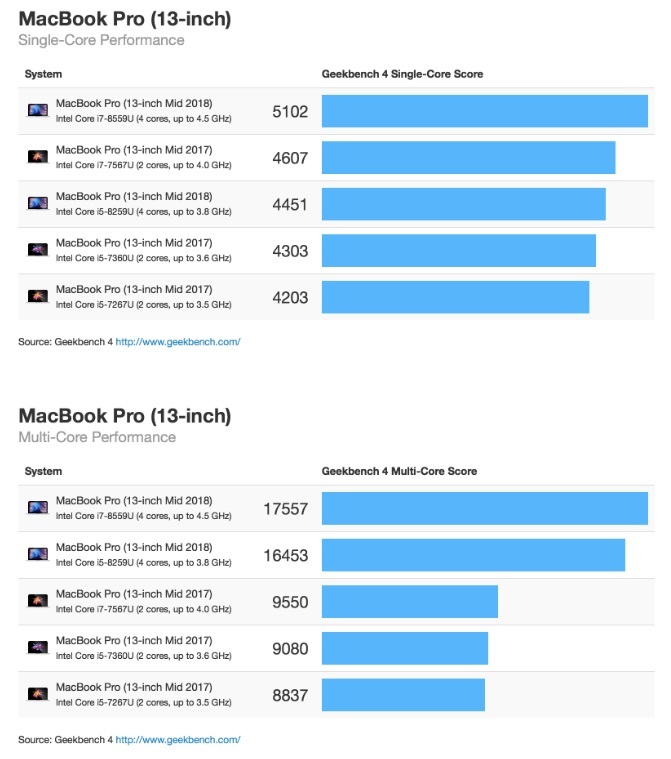 Apple's website lists several performance comparisons between 2017 and 2018 machines to show improvements, with examples below. According to Geekbench 4 benchmarks, the 8th-generation Intel processors in the 13-inch MacBook Pro offer a 3 to 11 percent improvement in single-core performance and an 81 to 86 percent increase in multi-core components compared to equivalent 2017 models. Both stock 13-inch MacBook Pro configurations include 8GB 2133MHz LPDDR3 RAM that's upgradeable to 16GB. Unlike the 15-inch MacBook Pro models, the 13-inch MacBook Pro models do not feature discrete graphics cards. Both of the new 13-inch machines include Intel Iris Plus Graphics 655 with 128MB of embedded DRAM, twice as much as previous-generation MacBook Pro models. Though the 13-inch MacBook Pro has a less powerful CPU and GPU than the 15-inch machine, it uses the same super fast SSD technology with sequential read speeds of up to 3.2GB/s and sequential write speeds of up to 2.2GB/s. Storage in the 13-inch MacBook Pro starts at 256GB, but it can be upgraded to a maximum of 2TB for an additional fee. The 13-inch MacBook Pro continues to offer a 720p FaceTime HD camera with no improvements introduced compared to the 2017 model. According to Apple, the 13-inch MacBook Pro offers "all day" battery life with 10 hours of wireless web usage, 10 hours of iTunes movie playback, and up to 30 days standby time. The new models use a 58-watt-hour lithium polymer battery that is higher capacity than the battery in the 2017 MacBook Pro. Bluetooth 5.0 is included, up from Bluetooth 4.2 in previous MacBook Pro machines. 802.11ac Wi-Fi is also supported. $1,799 - 2.3GHz quad-core Core i5 processor, Intel Iris Plus Graphics 655, 8GB RAM, 256GB SSD. $1,999 - 2.3GHz quad-core Core i5 processor, Intel Iris Plus Graphics 655, 8GB RAM, 512GB SSD. The 13-inch MacBook Pro build to order options include processor, RAM, and SSD upgrades. Apple teamed up with Blackmagic Design to launch an external GPU (eGPU) option that was designed for the MacBook Pro, providing powerful desktop-class performance without compromising the portability of the notebook design. Priced at $699, the Blackmagic eGPU is meant to allow MacBook Pro owners to connect to a higher-end GPU while working at a traditional workstation when more powerful graphics are needed for gaming, VR experiences, or creative tasks. 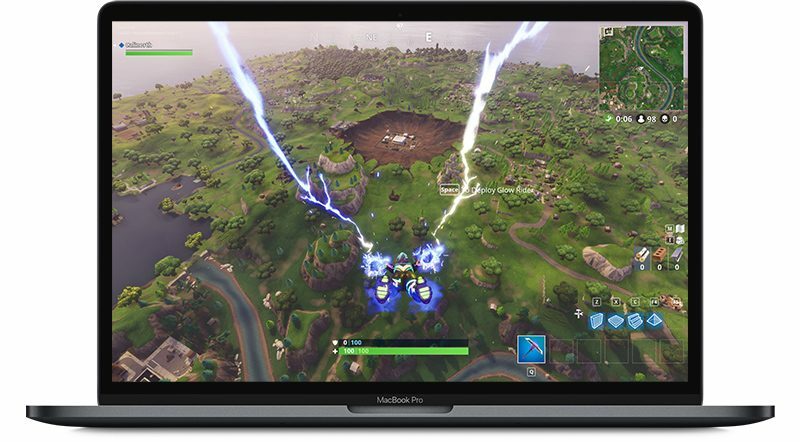 With the eGPU, for example, Fortnite on the 15-inch MacBook Pro is 2x faster than with the new 15-inch MacBook Pro's Radeon Pro 560X GPU, while Unity Editor is 2.2x faster and Maxon Cinema 4D is 2.8x faster. Improvements are even more impressive on the 13-inch machines that do not have discrete graphics cards. The Blackmagic eGPU is equipped with a Radeon Pro 580 graphics card and it has built-in I/O connections to drive a Thunderbolt 3 display, charge the MacBook Pro (85W power delivery), and support multiple accessories. There are two Thunderbolt 3 ports, four USB 3 ports, and one HDMI port. A Thunderbolt 3 cable is included. 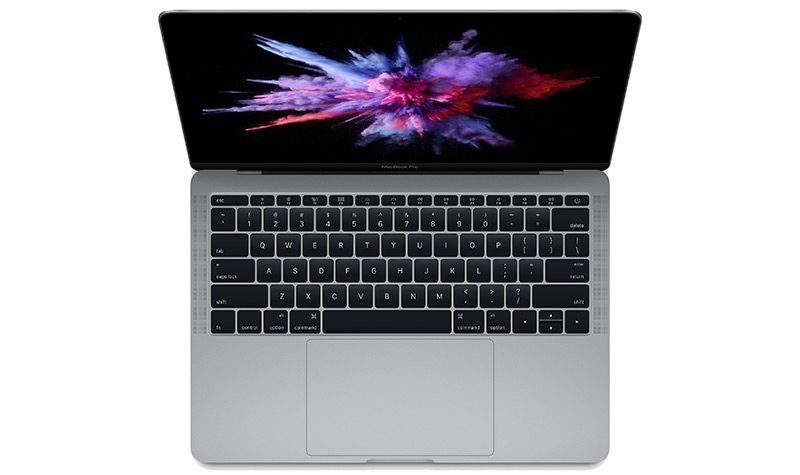 Alongside the new 2018 MacBook Pro machines with Touch Bar, Apple is continuing to sell an older 2017 13-inch MacBook Pro that does not include a Touch Bar and is aimed at customers who might have otherwise chosen to purchase a MacBook Air. $1,299 - 2.3GHz dual-core i5 Kaby Lake processor, 2133MHz RAM, 128GB SSD, Intel Iris Plus Graphics 640. $1,499 - 2.3GHz dual-core i5 Kaby Lake processor, 2133MHz RAM, 256GB SSD, Intel Iris Plus Graphics 640. There are upgrade options for these machines, allowing customers to boost the CPU, RAM, and SSD capacity. 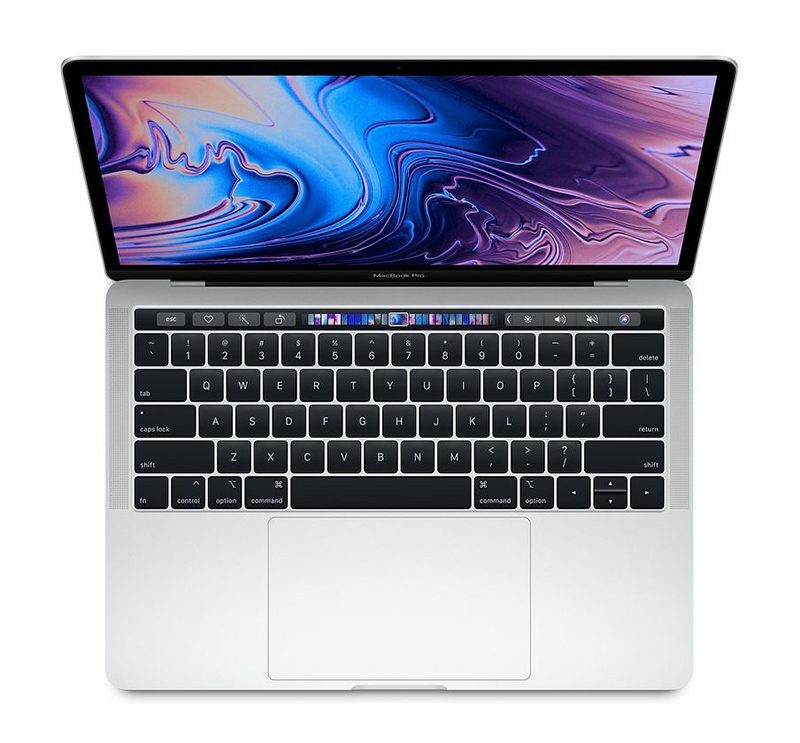 The 2018 MacBook Pro models can be purchased from Apple's website, Apple retail stores, and the retail locations and websites of third-party resellers like Best Buy and B&H Photo. 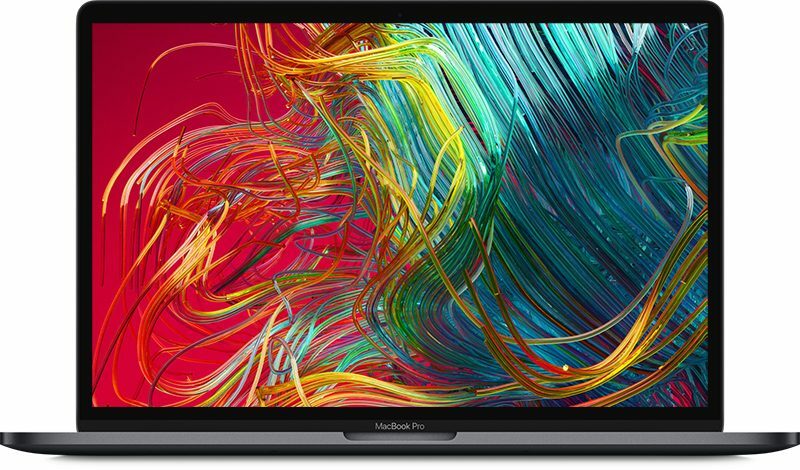 As of October, Apple is selling refreshed 13 and 15-inch 2018 MacBook Pro models, including the most recent MacBook Pro with Radeon Pro Vega graphics. on its refurbished website at a 15 percent discount over the regular price. All refurbished products are inspected before being sold and have the same warranty as new products. The Blackmagic eGPU that's being sold as an accessory for the MacBook Pro can be purchased from Apple for $699.